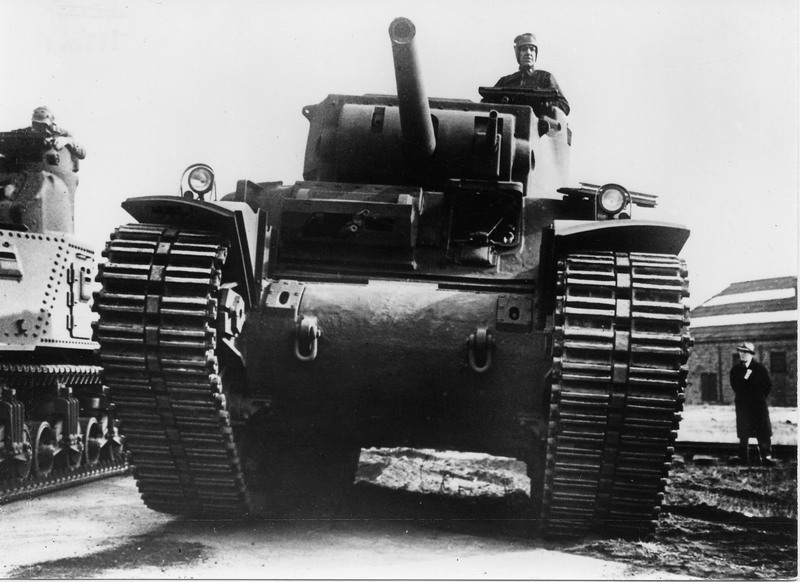 An early prototype of the M6 Heavy Tank, armed with a 76mm gun, the same as in the M10 Wolverine Tank Destroyer, with a coaxial 37mm gun. The hull front has a curious twin .30 Cal machinegun mounting. Many reasons are mooted for the Americans’ preference for the M4 Medium Tank, the much smaller Sherman, over this monster. But the true reason for the M6’s demise lay in the fact that when the US Army was choosing which tank to mass-produce to replace the flawed M3, Nazi U-Boats were taking a huge toll of Atlantic shipping. As three Shermans occupied the space of two M6 tanks, it was decided to go for the smaller tank; on the basis that, by cramming them into the cargo holds, of those ships which ran the U-Boat gauntlet more tanks per ship would arrive in Britain for the projected invasion of Europe. There was another significant drawback to sending the M6 to Britain. Because British railways had not been subject to sufficient Parliamentary regulation in their formative days, there were great variations in the gauge used on different lines. There was no guarantee that an M6 entrained at Liverpool could pass through the whole of Britain to arrive in the South-East ready for the jump to France. And sending them by road, wearing out the tracks and running gear, would require strengthening a large number of road bridges unable to cope with the M6’s weight. So the smaller and less effective Sherman was selected for mass production. Then when the Allies won the Battle of the Atlantic in 1943 it was too late to change back over. Accordingly, Allied tank crews were saddled with the Sherman up to the end of the War. Not to say not was not a good vehicle – it was. But as an armoured fighting vehicle it left much to be desired faced with the well-armed and armoured German tanks and SP Guns it would face in France and Germany. In the Normandy bocage it was accepted that to stalk a Tiger required three Shermans, to come at the German tank from three different directions, in the expectation that two out of the three Shermans would be destroyed. The depiction of the Shermans’ weaknesses in the film “Fury” is all too true to life. The M4 was grimly known as the “Ronson”, as per the contemporary advert which stated it was “guaranteed to light every time”. An M6 upgunned to the 90mm gun as used in the M36 Jackson, dropping the coaxial 37mm, and substituting a ball mounting for the clumsy twin MG hull mount, would have had a decent chance against a Tiger or a Panther, especially as it featured electric turret traverse against the hand traverse of its opponents. And the biggest gain would have been in the fighting morale of its crews. I await with bated breath the rivet counters’ responses as to why this would not have worked out…..